The field of personality psychology is exceptionally vibrant and draws on contributions from literature, neurobiology, economics, statistics, social science, cognitive science and more. Researchers in these fields are attempting to answer questions such as how do we make sense of the world and our role in it? To what degree do our actions and daily conduct emerge from the wellsprings of our personality? To what degree does our personality frame or filter our perceptions, provide a lens through which to see and plan our lives, and tilt us towards certain kinds of behaviour? How should we best conceptualize the biological (genetic, neurophysiological), environmental (social, physical, and symbolic), and idiosyncratic (motivational, personal commitments and projects) contexts of our lives? Experts in the measurement of personality (a field known as psychometrics) have been applying advanced statistical techniques to study the words and phrases people use to describe themselves and others. A theory known as the "lexical hypothesis" posits that all human language contains a relatively complete description of the important variation (similarities and differences) between individuals due to our social nature and need to cooperate and cohabit with minimal conflict. 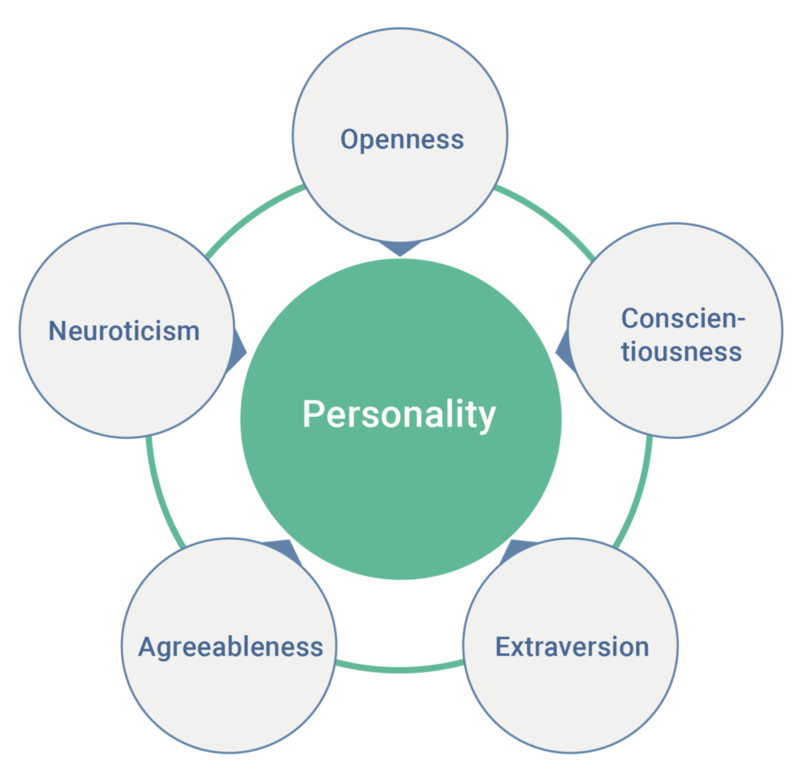 Consistently and cross-culturally, five such dimensions of variation (the Big Five) emerge: Extraversion (associated with sociability and positive emotion), Neuroticism (associated with negative emotion and withdrawal), Agreeableness (the primary dimension of care for others), Conscientiousness (associated with duty, precision and responsibility) and Openness (interest in ideas and aesthetics). The Big Five Aspects scale (developed by Dr. Colin DeYoung, Dr. Lena Quality, and Dr. Jordan B Peterson in Dr. Peterson's lab) extends the Big Five description (above) by breaking down each of the five traits into two higher-resolution aspects. Upon completing the assessment you will receive a detailed report comparing your responses to 10,000 others and describing your position along each of the Big Five dimensions, as well as information about each of the 10 related aspects. This personalized report will help you understand your personality in great detail, and aid you substantially in your understanding (and appreciation) of yourself and others. Our Coaches can "debrief" with you once you have your results and work with you to help you embody and apply the learning so that you can better orient yourself and cope with the diversity of opinion and viewpoints that make up your personal, familial, organizational, and social world. Your capacity to understand personality - yours and others - undergirds your capacity to understand and empathize with others, predict their behaviour, reason about their motivations, negotiate with them, and formulate joint games with them so that you can integrate yourself reasonably well with other people. The problem is, most of us don't understand personality very well - what it is and what it isn't, how personality scientists measure it, how it is we are able to adapt our behaviour to various situations and enact what researchers call "free traits", and even transform our personality over time. That is why we created and offer custom workshops to groups of individuals, teams, and organizations - to deepen the conversation and enrich the experience of understanding and reasoning about our personality, personal constructs, goals, and projects. We have found that too often people seek out 'personality' assessments or 'typologies' in order to categorize, 'stereotype,' or otherwise neatly label someone as 'this type' or 'that colour' without a sophisticated enough framework through which to explore the complexities of the science of personality. Assess and understand your personality through The Big Five Aspect Scale (described above). Discover and reason about your values, virtues and faults, personal constructs, and goals. Modify, improve, and/or transform your personality and behaviour. Align your choices, thinking, and commitments with your personality. Develop and strengthen your character, cognitive flexibility, resourcefulness, and resilience.